Known by names such as Bai Mu Dan (Bai Mudan) or white bai mu dan tea, White Peony tea is a Chinese beverage made from tea buds that haven’t opened and the first two leaves that have just sprouted. First produced in the Fuding and Zhenghe counties located in the Fujuan Province in China, it’s second only to Silver Needle tea. This USDA Organic Certified tea comes from Fuding City in China. Like a fine wine, Teavivre says it gets better with time, so this is a great tea to stock up on and notice how it changes as time passes. If you’d like to learn more about the company that makes this tea and what sets them apart, visit our in-depth Teavivre page. Bai Mu Dan translates as “white peony” in Chinese and the tea comes from the camellia sinensis plant like other teas, but from specific tea bushes called Da Bai (large white) and Narcissus. The highest grades have leaves that are covered in silvery down with a light color and sweet flavor. Delicate processing includes methods to ensure as little oxidation as possible, after harvesting in early Spring. Hand-picked to ensure minimal crushing of the leaves, the tea is withered for 1 – 3 days in the sun, piled for a short time and dried by light baking before packing and shipping. Depending on the grade, White Peony Tea has a delicate flavor that is floral with a warm scent that is reminiscent of fruit blossoms. 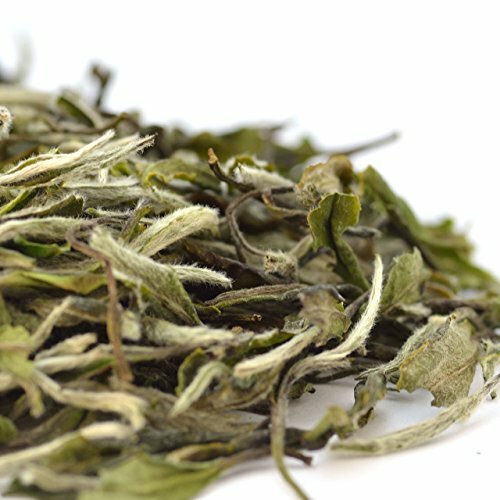 With a rounded mouth-feel that makes you think of light, sweet melons, this white tea is best served without milk and sweeteners, which can mask the gentle notes. More robust than Silver Needle, this tea ranges from light yellow to deep gold in color and is one of the more robust white teas. The aroma is mild with peony, floral notes and the flavor lingers, without grassy overtones. This is Teavivre’s white peony tea, as featured above. As with all herbal supplements, consult your doctor before consuming White Peony Tea. Containing medicinal properties that can enhance overall health, this tea is gentle enough to enjoy on a daily basis, depending on your own physiology. Supporting the Liver – the antioxidants contained in this tea help to protect the liver against damage caused by inflammation and assists with healing hepatitis and cirrhosis. Assisting Kidney Health – dealing with oxidative stress caused by diabetes and reducing symptoms of kidney-related diseases and injuries. Helping the Circulatory System – including blood thinning properties and protection against heart disease, assisting with blood vessel dilation and reducing blood pressure and bad cholesterol levels. Boosting the Immune System – naturally strengthening the immune system which helps fight against infections and viruses, with a high level of antioxidants. Even though it’s believed to have a low caffeine count, this tea can have as much as 5%, which is the same as Silver Needle. If you’re prone to headaches or if you’re pregnant or nursing, take it easy with this tea, due to the caffeine levels. When asking “What is White Peony Tea?” you wouldn’t expect it to have a link to Chinese mythology, as the name Bai Mudan is also associated with the most beautiful courtesan who was believed to be a reincarnation of the Peony Fairy. Something delightful to ponder while you enjoy your cup of White Peony Tea.